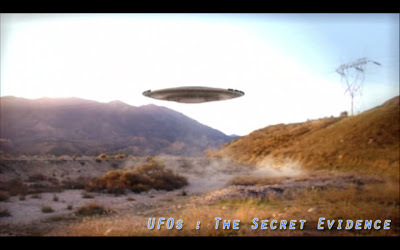 'UFOs : The Secret Evidence' is a 2 hour television programme set out to solve some of the great UFO mysteries, perhaps even provide a catch-all explanation for the whole field of Ufology. 'UFOs: The Secret Evidence' was written and presented by journalist Nick Cook, who has been an aviation editor and aerospace consultant for the world-renowned trade publication "Jane's Defence Weekly". His impeccable credentials might suggest a rather stuffy approach to the subject, but Nick Cook actually brings with him a down-to-earth, common sense approach which is refreshing. His stance on UFOs seems open-minded and objective. He also manages to gain interviews with some very intriguing individuals from the aerospace and intelligence fields. The programme started by asserting that UFO reports began during the Second World War. This is an incorrect assertion, unfortunately, ignoring a wealth of historical evidence dating back centuries. Still, it's probably fair to say that the first official military reports on the subject were generated in the 1940s, and that is the focus of Nick's investigation. He tackled the phenomenon of the 'Foo Fighters' reported by airmen during WWII and, with John Dering (a senior scientist at SARA), considered the possibility that the Nazis were sending up prototype Unmanned Aerial Vehicles which were "reusable"! A bizarre technological artefact known as 'the Fly Trap' was visited, and the theory that it was a test-rig for Nazi flying saucers was discussed. This was in the context of a secret Nazi underground base where derro-like scientists played with glowing bell-shaped devices which seemed to defy gravity. This was research which led to the death of several scientists, allegedly. Brigadier General Roger Ramey and Colonel Thomas J. BuBose with the Roswell 'wreakage' Then we moved onto the Roswell incident, via the infamous U.S. defence programme to incorporate Nazi scientists into sensitive research areas (like White Sands Missile Range), known as Operation Paperclip. The Roswell incident resulted, it was alleged, from a top secret defence programme known as 'Sky Hook', which sent up advanced surveillance balloons. Its flight path took it over Roswell, and when one crashed the UFO story was sprung to hide the truth about 'Sky Hook' from the Soviets. This is a running theme throughout Nick Cook's thesis. Whatever the truth behind the wider phenomenon, the subject was used mercilessly by intelligence agencies in the psychological war with the Soviet Union. This occurred to such an extent that UFOs became part of American culture for a long while; as a propaganda instrument UFOs were unrivalled in their success, it was claimed. Not only that, but the U.S. then used UFO flaps as a means to track the progress of their experimental craft. It all sounds like those clever military intelligence people had their finger on the pulse all along! This rose-tinted view of UFO history, US of A-style, was backed up by various characters from the Intelligence field interviewed by Nick Cook, who all smiled knowingly as they openly revealed the deepest secrets of military intelligence to the public. "We suckered you all, you fools!" they arrogantly insinuated. But this version of history runs against the grain of the U.S. Government's public panic over the subject at the time, as revealed in various memos that have come to light. After the death of the brutal Soviet premier Joseph Stalin, the CIA upped the ante, using UFOs as a propaganda tool to cover up the top secret flights of the U2 spy-plane over the Soviet Union. It didn't work, of course, because the Soviets shot one down. One would have expected the UFO phenomenon to stop dead in its tracks at that point. But, no, on it went, cruelly ignoring the whole CIA/Propaganda theory. So various other aerospace oddities are wheeled out of their hangers to shock and amaze us. Like the 'Avro Car', and the 'Silver Bug'. There is something to be said for the idea that sightings of UFOs at or near sensitive aerospace research establishments might just have something to do with what's going on there. Policeman Lonnie Zamora might have seen a 'Silver Bug', or a downed prototype Sampler destined for the Moon, next to White Sands, for instance. The Russians certainly seemed to be well and truly hooked on UFOs, with Andropov ordering the Red Army to watch the skies, which they did dutifully for 13 years. But the canny Russians would have known that the Americans liked to regularly risk their young pilots on surveillance missions across Soviet territory, despite already having spy satellite technology quite sufficient for the task. There's more to all this than meets the eye. Yes, Stealth aircraft undoubtedly contributed to UFO sightings. But that's not the whole story. And Nick Cook seems to realise that too. The first hint of that came when watching the uncomfortable reaction of British sceptics Andy Roberts and Dave Clarke to his gentle questioning. They were not amongst friends, one could judge. Then his appraisal of the eye-witness account of pilot Tom Hanley, who described the incredible manoeuvring capability of an unidentified flying object darting around his reconnaissance aircraft, seemed to open up greater potentials than the US military dangerously interfering with its own advanced aircraft. The 1952 flap over Washington D.C. also brought about a pause for thought. Nick Cook is not a dyed-in-the-wool sceptic by any means. He then tackled subsidiary subjects, like cattle mutilations across stretches of the continental USA. He concluded that these were covert missions carried out by military agents using helicopters and field-based surgical equipment, to monitor contamination levels of some kind. It would have been easier to just buy some cattle and then take body parts to the lab for analysis, I'd have thought. But ten out of ten for style, that's for sure. Then there was the alien abduction phenomenon, which is a massive subject in its own right. Nick Cook looked at the Travis Walton case, including an excellent interview with the man himself. No explanation was forthcoming, except for a generalised gloss over the experiences of the Contactees some years before. Perhaps to try to indict the U.S. Government in human experiments against the will, or knowledge, of the victims involved, was a step too far for Cook. The U.S. Government's dismissive contempt for the great, impoverished mass of its own people has been clear to see for many years, most recently noted during the Hurricane Katrina debacle. So it's possible, surely? 'UFOs: The Secret Evidence" wound up with a look at satellite photographs showing contrails from an unidentified craft which flew halfway across the globe at 8000mph. 'Aurora' was the modern UFO par excellence, it seems. But however fast these things get, the fact remains that the difficulty with identifying many UFOs lies in their bizarre patterns of manoeuvrability. If the Nazis created the Foo Fighters back in the 1940s, then why the heck are we still flying around in fixed wing aircraft 60 years later? It all seems so unlikely. Yes, UFOs were a wonderful cover story to hide black projects behind, but the black projects in themselves do not completely solve the UFO problem. Not by a long chalk. In the end, Nick Cook seemed to agree.